Four years ago today we left behind all that was familiar and set out on a grand adventure. At the time there were a lot of unknowns. Would we miss the stability of a fixed location? Would we go crazy while living in such a small space? Could we really travel and work at the same time? Four years later and those unknowns are now a part of our everyday life. A life we are thrilled with and look forward to enjoying for many more years. 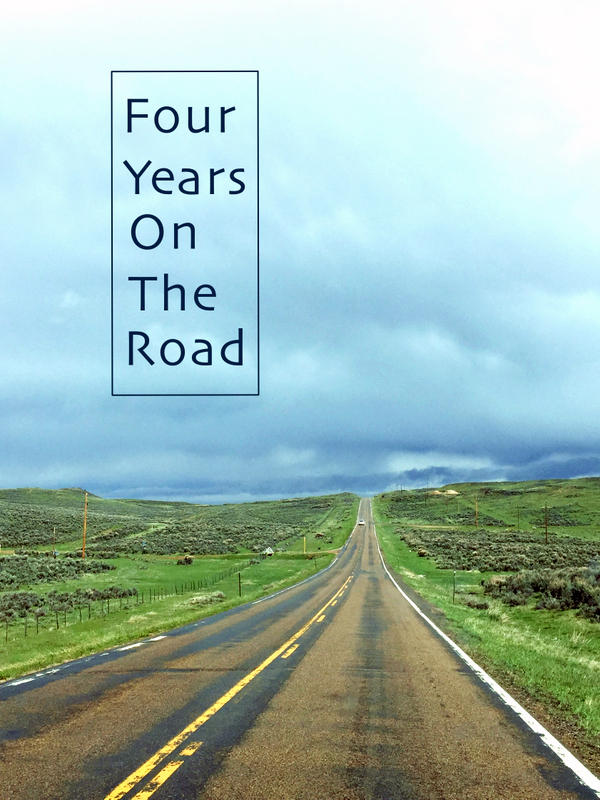 In past years we’ve celebrated our on-the-road anniversaries with posts about where we’ve been, our favorite places, and lessons we’ve learned. This year we’re going to the practical side with a list of advice — practical advice for full-time RVing to be exact. Stay organized. Have a place for everything and put it back when you’re done with it. Don’t forget to reserve early for those popular holiday camping weekends. Try not to get too annoyed at the energetic kids/ noisy college students/ large & boisterous family in the site next to you. Remember, they’re on vacation and have to go home in a few days. You get to live this everyday. Have enough underwear so you only have to do laundry every two weeks. You don’t always need the latest and greatest. You will get by fine with an older RV, used bikes, and those chairs that have been kicking around since the ’80s. Before you have your RV outfitted with 6 batteries and 10 solar panels, live in it for a bit. Learn how much power you use and build a system to fit your needs. It might mean you (gasp) have to use the generator for a few months. You’ll survive. Share inspiration, advice, and great camping spots with others. Use social media to connect with other travelers, but don’t let it rule your life or determine your self worth. Love your space. If you don’t love your space, change it so you do. If your first question about full-time RVing is, “How do you stand to spend so much time with your spouse?”, full-time RVing with a partner is probably not for you. Don’t give your GPS absolute power. Always double check the route before ‘Hank’ directs you down a skinny dirt road with no place to turn around. Chill out and go with the flow (feel free to apply this all parts of life). Respect our public lands and encourage others to do the same. Everything you used to cook in your “sticks n’ bricks” home you can still cook in your RV. Except it tastes better because you didn’t have to make it after an 8-hour work day wedged between two 45 minute commutes. Have an easy go-to meal for travel days. Always scout out boondocking spots without your RV. Yes, it can be a hassle, but so is getting your 20,000lb RV stuck in the middle of nowhere. You don’t need to leave your hot water heater on all the time. I mean really, how much hot water do you need? Have an extra key for the RV — or two, or three. Finding a place to recycle is harder than it should be. Carry a large bin or box for storage between drop offs. Some businesses in small towns will accept packages for you. General delivery through the USPS is a relatively painless way to receive mail on the road. Just be aware that small town post offices often have limited hours – and those hours are not necessarily the hours posted on the door. Unless you have unlimited cellular data, you’ll always wish you had more data. A cell phone booster + good antenna is a purchase you’ll never regret making. Never wear flip flops at the dump station. You’re not a bad person if you enjoy watching TV in your RV. Just remember to get out and watch the sunset as well. At least try to fix it yourself. Don’t be the type of person who looks down on others for the type of RV they have, or they way they prefer to live. We’re all in this together. Use RVing as motivation to be more active, not an excuse to be less. I’ve been following you for over a year now. Started when we first bought our Airstream. We’re not full time (yet) but since getting the AS we’ve only spent a few months here in MN in the summer. Rest has been traveling the country. We just got back from a trip thru ND, Eastern Washington and Moab ( kind of the reverse if your recent travels). Love love love your posts! You very nicely sent me a photo of how you store your store your bikes. We used that to design our truck bed space. So glad you are enjoying Minnesota (my home state). Any chance you’ll be near the Twin Cities? Would love to meet you “in the flesh”. If not–thanks so much for all your informative posts!! You (and Tim) inspire me every day. Sounds like you’ve been having a blast traveling in your Airstream! Unfortunately, we won’t be anywhere near the Twin Cities this time around as we’re headed north into Canada next week and then driving east to Maine. We’ll definitely be back to explore more of Minnesota someday though – we’re really loving it here! Enjoy Canada. We did a 5 month trip to Yukon/Alaska in our mini Winnebago 2 summers ago. If you need any ideas re Canada just email. Hi, plan to full time this September…selling home. How do you have a home state if you’re on the road? A family member? What about voting?thanks! Some people use a family member’s address, but most full-timers establish residency in a “nomad friendly” state. We are currently residents of South Dakota where we have a mailing address and can apply for absentee voting ballots. Great list. Most apply to the 5-6-week travellers like us, too. I love followng your journeys and hope you like Ontario and Quebec this summer (we’re from Ontario). I have been reviewing your Wyoming and Montana posts as we’re heading there. I realized I have missed Phineas, who was featured a lot in those earlier posts. Sweet, water-loving pup. Be safe, be happy and enjoy your wonderful life. I found your blog by accident, but isn’t that the way ….unexpected co-incidences, sychronistically speaking. I am enjoying learning from you. We are truck campers ( 1976 Alaskan) and have only been traveling for less than a year. It sounds like you are extremely busy in your lifestyle but I have a suggestion to offer you and other bloggers of similar lifestyles. If you are familiar with the wander the west blog, I’m “wandering ” why someone can’t start a wander the east blog? If I wasn’t computer iliterate I might consider it myself. I live in northern Kentucky and have travelled everywhere east of the Mississippi but would like to know more about the adventures of those who travel in rv’s/truck campers. The upside to your blog is at least we have the wandering watsons to advise and assist the novices and newbies like us. Thanks, Fran. Awesome post! #32 is the best : ) Happy 4 year anniversary and thanks for everything you share with all of us! Yup, that’s one piece of advice everyone should follow! Love this post, and of course was laughing at 32. :) Happy Anniversary! Thanks Diane! We do have some fun plans for the next year…stay tuned! This is a great list, Amanda—fun and helpful, like all of your posts. We’ve found all of the things you listed to be true for us, as well—although I have three weeks of underwear, just in case we don’t feel like doing laundry. (Waiting three weeks makes for some epic laundry days, though.) Here’s to many more years of wonderful travels! Three weeks! That’s a lot of underwear! Hello, Amanda and Tim – What a fun and practical list. Good advice. I plan to be a full timer in August. Excited and a little nervous. I am now in the process of getting rid of extra things and probably will continue to find unused items after I am in my Casita and traveling. I really enjoy you blog and admire all the hiking and biking and kayaking you two do. You are able to get up to some amazing outlooks and see the country from almost a birds’ eye view. Congratulations on your FOUR year anniversary! Good job. Happy travels and thank you for sharing. I always enjoy seeing what you two are doing. Even four years later we still purge our stuff on a regular basis. I just donated a box of things that hadn’t been used in 4 years – time to go! How exciting that your full-time adventure is about to begin! I remember well that excited and nervous feeling. I also remember how all the nervousness and fear melted away when we finally pulled away from our old house and started living the dream. Happy travels! Great list! Shared it with Charles & he loved it. # 32 made me laugh. I hope that wasn’t experience speaking. Let’s just say that we’ve seen enough dump stations to know you want to keep those feet covered! Congratulations and Cheers to more years on the road. What a fun and true list and very helpful. Keep it up. Thanks Mona Liza! So happy we got to meet you and Steve this year! Congrats on your 4th Nomadiversary! An awesome list, and was nodding along with each one. Congratulations! We begin our seventh year on the June 21!! Wow! Does time ever go fast. We initially thought we would travel for a year or two but then be bored and we would work camp…haha!!! Too funny! After six full years our list of places is longer than ever. Not mention all the return trips we want to do. You list is excellent! Well covered:) Wishing you and Tim many more wonderful years on the road:) Sure beats the same office view every day! 7 years! Yeah, it’s hard to imagine getting bored of this life isn’t it? I love your list. I want to thank you for the list as it comes at a great time. I just began my journey as a full-time Rv’er and after taking photos and personal memorabilia to my sisters home to lighten my travel load, your number #8 hit home for me. The local Good Will Store will become the recipient of another twenty pound of clutter, I would never use. Thanks for posting the list and reading through it is a reminder for our lifestyle. Happy to provide the timely reminder. We’re still in constant purge mode – always going through our stuff and getting rid of unused items. It always feels good to only be surrounded by the things we really need and use. Good luck on your full-time journey and maybe we’ll see you out there on the road! Can’t believe it’s been 4 years! Great little list! Here’s to many more on the road. Time flies when you’re living the dream! Yup, living full-time in an RV with your spouse it definitely not for everyone! We’ve been living in our Airstream for a couple of months now and have already implemented a number of things on your list. We’re still finding things to give away and we were careful not to throw away too many pairs or underwear when downsizing ;) Those extra keys sound important. We should probably hide one somewhere in our truck so we’d have to get locked out of both to have an issue. Congratulations on 4 years! I’m glad to see you guys are still loving the lifestyle. I hope we look back with similar joy 4 years from now. Oh yes, the extra keys are very important. Getting a few before you need them is the key :) Congrats on full-timing! Yes to all! I was just complaining about the noisy people in the cabin up the hill when I started reading your list. Okay, I’ll remember they have limited time :-) Congrats on four years of freedom and adventure – and here’s to as many more as you continue to enjoy!! Excellent post, we started fulltiming in January of 2011 and still love it…. I would add one more to your list…..take back roads you will see much more:) …safe travels.